Precious Metals ETF Trading: It's been a week since my last gold & silver report which I took a lot of heat because of my bearish outlook. Friday's closing price has this sector trading precariously close to a major sell off if it's not already started. On a percentage bases I feel precious metals mining stocks as whole will be selling at a sharp discount in another week or three. 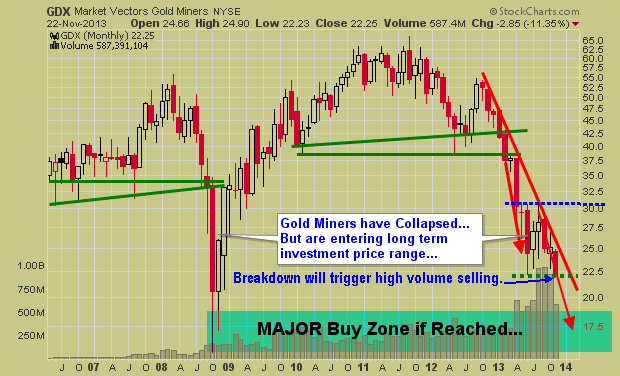 ETF funds like the GDX, GDXJ and SIL have the most downside potential. The amount of emails I received from followers of those who have been buying more precious metals and gold stocks as price continues to fall was mind blowing. If precious metals continue to fall on Monday and Tuesday of this week selling volume should spike as protective stops will be getting run and the individuals who are underwater with a large percentage of their portfolio in the precious metals sector could start getting margin calls and cause another washout, spike low similar to what we saw in 2008. Below are updated with Friday's closing prices showing technical breakdowns across the board..
Just to make things a little more interesting I would like to point out a couple other types of analysis. 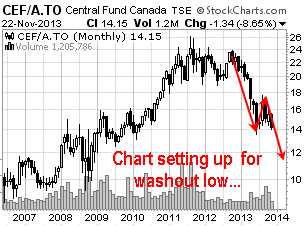 Sweet: Through analysis of the CEF Central Fund of Canada Ltd. chart and evaluation it is clear precious metals are falling out of favor at an increased rate. This fund owns physical gold and silver bullion and investors are fleeing the fund so fast that it is now trading at a 7% discount of its asset value. 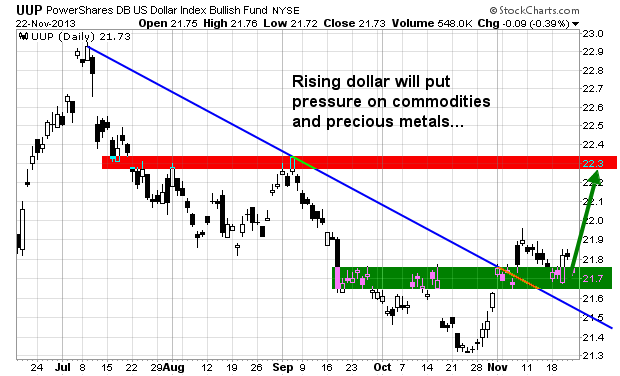 While this may not seem good for metals I see it as a positive. When everyone is running for one door after an extended moves has already taken place it tends to act as a contrarian indicator. Knowing that some of the largest percent moves in a trend takes place before reversing, I see this information as an early warning that a bottom will soon be put in place. Sour: While the USD index has not been much help compared to 2012, I feel as though a rising dollar is likely to unfold for a couple weeks which may lend a hand to pulling the precious metals sector down. 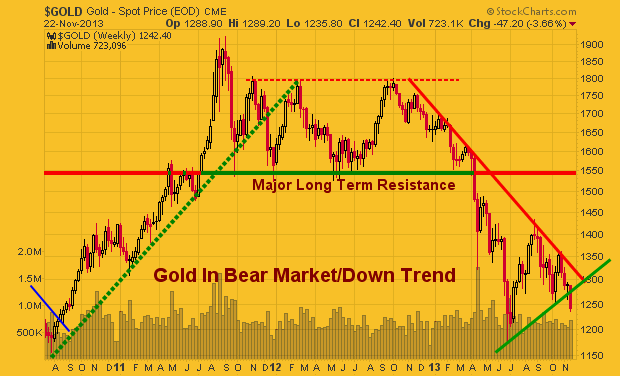 While I am starting to get bullish for a long term investment in precious metals I know that a bottom has likely not yet been made. But even if it has been, it is better to buy during a basing pattern or breakout to the upside from a basing pattern than to be underwater with a position for an extended period of time along with all the other negatives that come along with it. I do like the idea of CEF as a long term investment when I feel the time is right. I have invested and traded it many times in the past. The key to trading the fund is to be sure you are buying it at fair value or a discount from the net asset value. You do not want to be buying it when it is trading at a 5-7% premium. 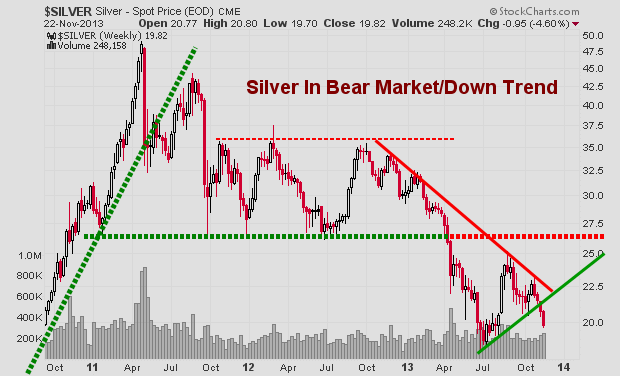 The fund owns both gold and silver making it a simple diversified precious metals play.